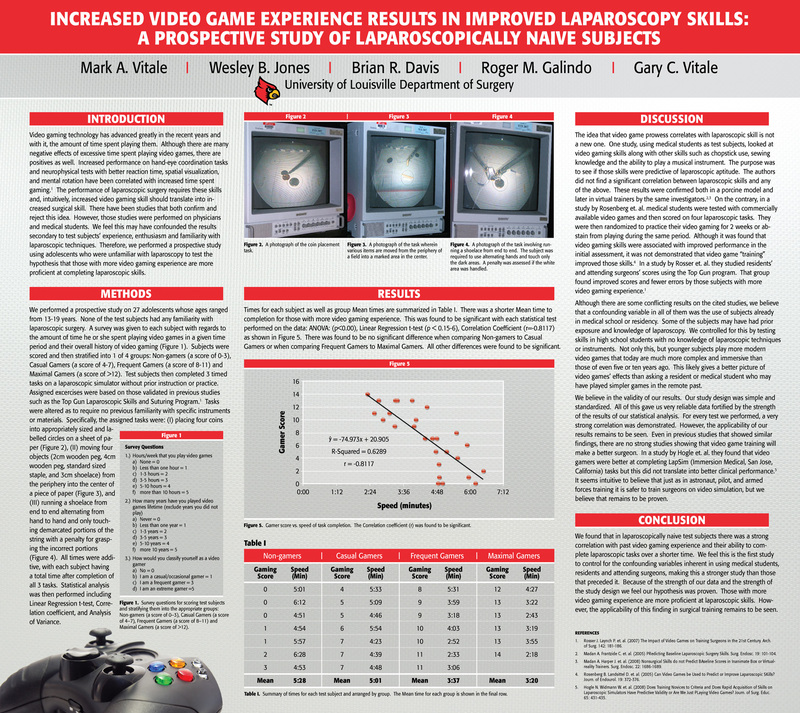 Introduction: Although studies have examined the effects of video-game prowess on laparoscopic skills, there is little data showing a significant positive correlation. Prior studies were often performed on physicians and medical students, possibly confounding the results secondary to test subjects’ experience, enthusiasm and familiarity with laparoscopic techniques. To control for this, we performed a prospective study using adolescents who were completely unfamiliar with laparoscopy. Methods: Each of the 27 test subjects was stratified into one of four groups ranging from no experience to maximal experience according to his or her results from a standardized survey addressing video-gaming experience. Subjects then performed three timed skill tests on a laparoscopic trainer without prior exposure or practice. Statistical analysis was performed. Results: In groups 1-4 (in order of increasing video-game experience) there was a shorter mean time to completion of the set skill tasks: 328, 301, 217, and 200 seconds respectively. There was an obvious relationship between video-gaming experience and time required to complete the set tasks. Statistical significance was confirmed using Linear Regression t-test (p <0.15-6), Correlation coefficient (r=-0.8117), and Analysis of Variance statistical test (p ≈ 0.00). Conclusions: Given the fact that there was a very strong, positive correlation between video game usage and laparoscopic performance using multiple statistical analyses, we conclude that increased video-gaming experience results in improved laparoscopic skills among inexperienced individuals.